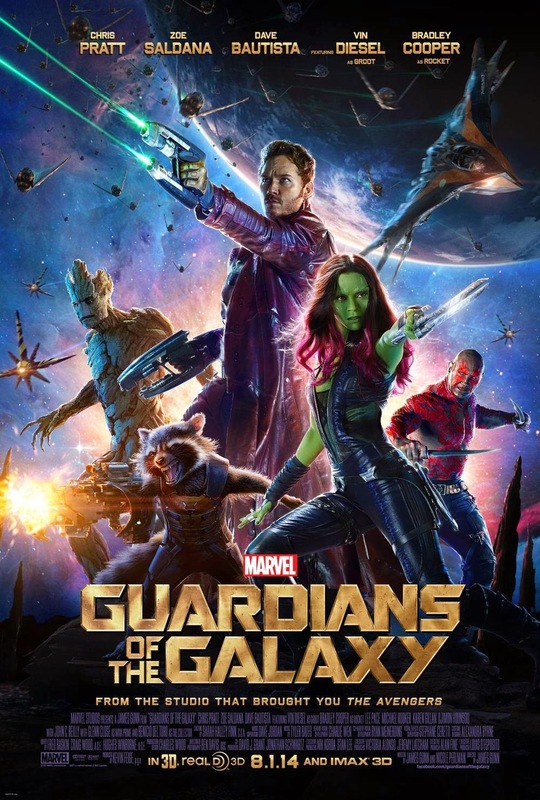 Guardians of the Galaxy ~ First things first, there will be spoilers for the movie, so if you're looking for a spoiler-free review of Guardians of the Galaxy, that review can be found at Biff Bam Pop! right here, and really, what are you waiting for already? See the movie! 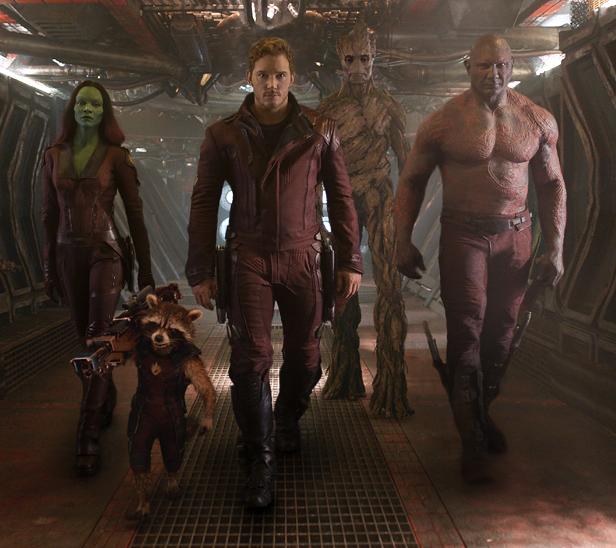 I should confess that these aren't my Guardians of the Galaxy in the movie. 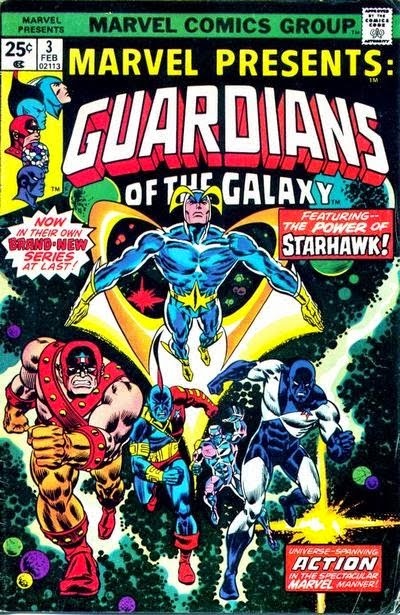 I first encountered the Guardians of the Galaxy back in the 1970s at the Berlin Auction, or the Berlin Farmers Market for the folks from Cherry Hill, at one of those newsstands where they would tear the tops of the covers off of comics and sell them three for a quarter. Sometimes the pickings would be sparse, and instead of a Flash or Justice League, you would end up getting something different that you didn't necessarily want. This is how stuff like Lois Lane or Tarzan Family or Daredevil would end up in your collection, ready to be traded at school for something you thought was better. One of those books that I actually enjoyed and didn't trade was Marvel Presents #3, featuring the original Guardians of the Galaxy. I loved this book. Here the original and somewhat redesigned members of the team - Charlie-27 of Jupiter, Martinex of Pluto, Yondu of Alpha Centauri, and Vance Astro of Earth - were teamed with the cosmic-powered Starhawk to finish off the alien invaders, the Badoon, who had enslaved mankind. This was in the 30th century, and I was well aware of Marvel trying to parallel DC Comics' Legion of Super-Heroes, but I didn't care, this was cool. These heroes bounced around different titles throughout the 1970s before scoring their own series in the 1980s, before disappearing. 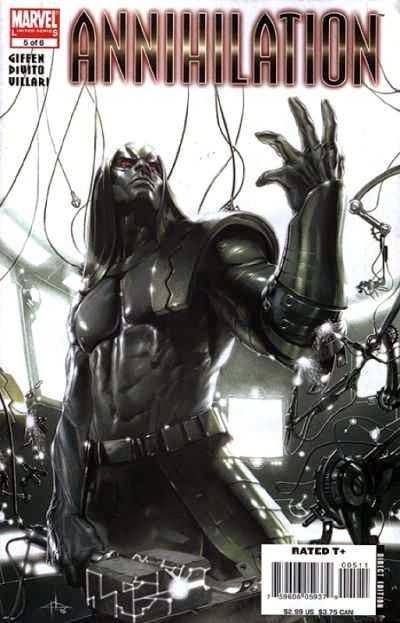 These new Guardians of the Galaxy were born in the fires of the Marvel Comics crossover event called Annihilation and its spin-offs and sequels. This event brainstormed by Dan Abnett and Andy Lanning took almost all of Marvel's space and cosmic heroes and wove all of their mythologies into one coherent continuity. And that is really what is so amazing about the movie. All of these characters have such continuity-heavy backgrounds in the comics, but in the film are presented with just what you need to know to enjoy the flick. It's magic, and serious props should go to James Gunn and Nicole Perlman. 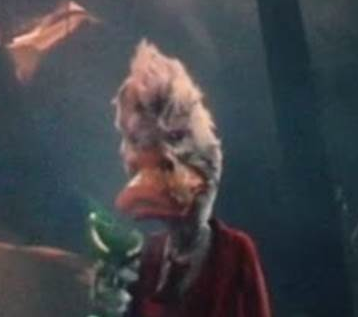 Star-Lord and Rocket Raccoon were pretty much, to my knowledge at least, one-shot characters from the late 1970s. Thanos, Drax the Destroyer, Lady Gamora, Nebula and that bunch were all part of that weird 1970s cosmic epic involving Captain Mar-Vell and Adam Warlock by Jim Starlin before that. And Groot, well, Groot predates Marvel, going waaay back to Atlas Comics when Stan Lee and Jack Kirby were doing giant monster and alien invasion stories in the 1950s. Annihilation brought them together as a team before they came to the big screen. That's that, but as I said, everything you need to know about these characters is on the screen. There are Easter eggs and tidbits from earlier Marvel movies in here, and it's a major bonus if you know about them, but you don't need to know anything to see and enjoy Guardians of the Galaxy. This could very well be the first Marvel movie for all the background needed. In other words, the fanboy and the fangirl can bring their significant others to this flick and they will enjoy it just as much as their partner. You'll meet Star-Lord, played by Chris Pratt, playing his charm and charisma for all its worth. He's a funny leading man who will make you blow raspberries at that Robert Downey Jr. guy. He is the default leader of the rogues who become the Guardians. Zoe Saldana plays living weapon Gamora, with wrestler Dave Bautista (or is it Batista? I've seen it spelled both ways) as the literal-minded Drax the Destroyer. The personality quirks of these two characters mixed with Star-Lord are part of what makes this flick so much fun. 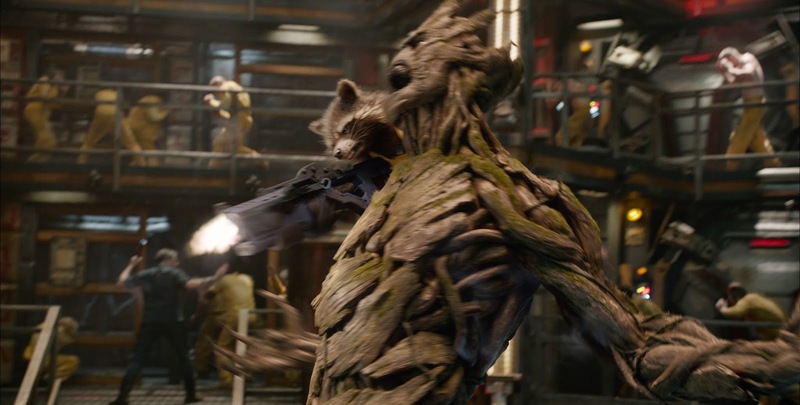 The real fun with characters and interaction come from the two CGI entries Rocket and Groot. Rocket is a genetically engineered raccoon (but don't call him that) who's as handy with tech as he is with big guns. Voiced by Oscar-nominated actor Bradley Cooper, Rocket and his bodyguard/partner Groot are the breakout characters here. Groot, whose vocabulary consists of three words, "I am Groot" (voiced by Vin Diesel), is a huge tree creature of many different abilities. Both of them are lots of fun. These characters go from hating each other to making a Great Escape break out to eventually saving the galaxy - I'm sure that's not a spoiler or surprise, but their bonding is at the core of the flick. 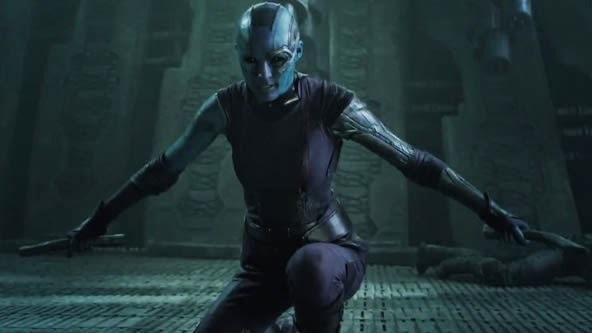 Real plot details involve big bads everywhere, including James Brolin's Thanos, Benicio del Toro as The Collector, former "Doctor Who"companion Karen Gillan as Nebula, Michael Rooker of "The Walking Dead" as Yondu, and the wonderfully designed Ronan the Accuser as played by Lee Pace. One of the best parts of Guardians of the Galaxy is the soundtrack, not the terrific score by Tyler Bates, but the songs featured throughout. Star-Lord has a cassette tape of 1970s hits that play throughout the film, and it is almost as important as the characters to the film, because the movie wouldn't be the same without it. The 1970s vibe rocks the movie and makes it special. It is not all good however. We get precious little of Thanos, and the Collector's scenes are more than a bit disappointing (although we get to see a Celestial! 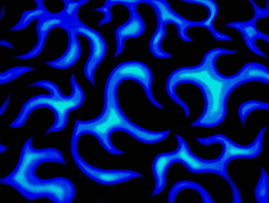 ), although I did dig that his home was inside the dead skull of a Celestial. I would have liked to have seen more use of Nebula, as would most "Doctor Who" fans coming to the flick. I am sure however we will see her again, as well as her father as I believe Thanos plays heavily in Avengers 3, and of course Guardians 2 is a go as well. If wanting more is my only complaint, how bad could the flick really be? In fact, I think this is one of the best of the marvel movies, right up there with Iron Man, Captain America, and Avengers, and that's high praise indeed. If you want a bit more of my thoughts (and The Bride's), you can check out our special Guardians of the Galaxy episode of The Make Mine Magic Podcast. Dave Bautista is his real name. Batista is the character he plays in the WWE.